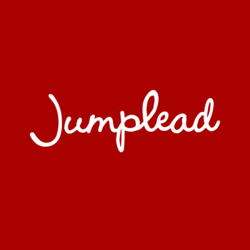 Adding Jumplead Boosts Website Lead Generation Effectiveness. Jumplead is an innovative online lead generation service designed to increase the marketing effectiveness of existing websites by combining visitor identification, live chat and lead management facilities. Jumplead offers a huge amount of insight and functionality for a very modest fee. We’re wondering how we ever got by without it! Jumplead the website lead generation service provides a new way of generating and managing business leads from existing websites. Adding the Jumplead code to a website enables real-time identification of visiting organisations as well as the ability to chat to visitors directly. The system comes complete with lead management facilities. “Marketing is an expensive activity and websites are a natural focus for customer interest, we wanted to create a way to connect businesses with their visitors, improving service levels for visitors and return on marketing spend for website owners”, said Jumplead Director Matt Fenn. “We're very excited about the business opportunities that Jumplead creates, the response we're getting from customers is very encouraging”. Jumplead works by identifying the names and contact details of businesses visiting a website. This information is combined with search phrases and the pages visited to provide an insight into the requirements of new business prospects. With the inclusion of live chat and lead management functionality Jumplead enables both real-time connection with visitors and longer term management of interactions with prospects to ensure that opportunities Jumplead generates are not lost. "Everything we are doing with Jumplead is about connecting businesses with their prospects, so live chat was a logical addition, plus it boosts service level perception for visitors" said Fenn. The Jumplead service certainly brings businesses and their prospects closer together but it seems as though the effectiveness of this kind of tool rests largely upon how it is used. "We are seeing customers using Jumplead to identify prospects, and then aligning themselves with the prospect using targeted blog articles and Linkedin connections before making a considered approach" said Fenn. "There'll always be the 'You've been on my website' openers, but we discourage this kind of thing as it just irritates." Advanced filtering options allow custom targeted lead 'Streams' to be created and shared with other Jumplead users. Alerts can also be set for 'Key pages' to send emails when they are visited. The Jumplead b2b lead generation service is delivered as web application with no long term contract and pricing that starts at £50 per Month. A 14 day free trial is available which allows potential customers to try the system for themselves.